So, you’ve spent months planning your wedding menu throughout the day, right down to every last tiny detail. But on your wedding day you will be so busy that it sometimes can be quite hard to find the time to enjoy the food you’ve spent such a long-time planning. 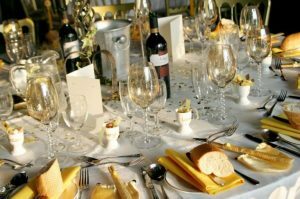 Follow Anise Catering’s handy tips to ensure you don’t go hungry on the most important day of your life! Pick the food and drink you want when deciding your menu. Family and friends can give you their opinions and recommendations but remember that ultimately, it’s your decision. We will help guide you with our menus that can be personalised and tailored accordingly depending on what you are looking for. Read our reviews here. Set yourself up with a good, hearty breakfast. Slow burning energy foods like porridge or eggs are a good option. A wedding day is a long day and you will expend a lot of nervous energy in anticipation, excitement and that’s not to mention the amazing moves you’ll be throwing later on the dance floor! If you’re opting for canapes or a buffet style meal, set yourself some time to eat something. The day will go so quickly and you’ll find everybody wanting to talk to you. It’s necessary to give yourself some down time out to go and sit down and relax and enjoy the fare you and your partner have chosen. There will be time later to chat to your guests. If you’ve chosen a wedding breakfast, there will be time to sit down and eat and drink. If you are giving a speech though and nervous anticipation has displaced hunger, do not fear – ask the kitchen to save you some for later rather than filling up just on booze or wedding cake. You’ll find it’s the one day where you keep getting bought drinks. Obviously, this is great – and nobody likes turning down a free drink – but don’t mix your alcohol too early on and drink lots of water – boring, Yes, we know but you’ll actually remember – and enjoy your wedding day and you’ll be thankful of it the next day (especially if you have important jobs to do!). Grab a slice of wedding cake after cutting it otherwise it might get devoured! And don’t forget the evening snacks that provide the perfect fuel for an evening of jollity and dancing.